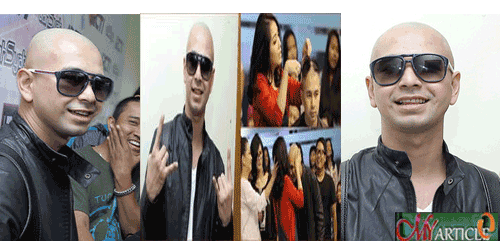 Some time ago, Raffi Ahmad was doing a promise to shave his hair when his wife, Nagita Slavina pregnant. Today, Sunday (8/2) that prove his lively presenter with shaved her head in the event of a private station that is DAHSYAT on RCTI. Raffi new appearance would invite curiosity reporters. Interviewed after the event took place, Raffi little talk about the sensational action and make the public curious to know. "It (bare) because raffi promise when his wife (Gigi) is pregnant. Should yesterday (fitting event DAHSYAT Awards) but because there was shooting commercials and many contracts that must be completed, so once completed new now raffi shave off my hair, "said Syahnaz Sadiqah Her sister raffi ahmad). Raffi previously typical hair looks nice, now have to be willing to not have any hair-piece. In response, the man born in Bandung would not bother. "It's okay (bald) already this behavior, already had a wife. Let it be like Ahmad Dhani or Deddy Corbuzier. All my life this is the first time I bald. My mother could not bear if I'm bald. But because of this promise, so it is the intention, "said Raffi. The decision to change this appearance does not make Raffi fear of losing a job and a career in the future. He believes if fortune will always come to him and the family. "Do not be delayed if the name is Promise. If fortune would go on. Her hair is stored in the ground let lush growth," says 27-year-old man.